“itis” means ‘to be inflamed’. ‘itis’ is often added to end of the name of a part of the body to describe an inflammatory condition of that part. The cornea is the clear window at the front of your eye. Inflammation of this tissue is call keratitis. A superficial case of keratitis can be treated and will heal with minimal side effects. As a general rule the deeper the pathenogen penetrates the corneal tissue the more painful and severe the reaction will become. When this inflammation reaches the deeper layers of the cornea, treatment becomes more aggressive to minimize the resulting scarring. Scarring in the clear corneal tissue will result in some degree of vision loss. Inflammation of the cornea can be viral, fungal or bacterial in nature. Over the counter medicines are ineffective and can lead to severe damage to your eye. Your doctor will assess your condition and prescribe an appropriate medication. A much more serious form of the inflammation is ulcerative keratitis, in which an ulcer forms in the clear tissue of the cornea. Here the offending agent, again viral, fungal or bacterial, penetrates the outside layer of the tissue attacking the stroma in the deeper recesses of the cornea. This is an extremely painful condition that can lead to blindness. Ulcerative keratitis requires immediate medical attention. Your physician will prescribe an aggressive application of a condition-specific medication and monitor your response very closely. Even with aggressive treatments, more intense inflammations can lead to varying degrees of scar tissue formation. This results in a loss of eyesight. In more dramatic presentations, after the resolution of the keratitis a corneal transplant may be necessary to restore some useful vision. The tissue connecting the sclera, the white outside layer of the eye, to the conjunctiva, its overlying mucous membrane, is called the episclera. Episcleritis, an inflammation of this tissue is mild and rarely triggers the more severe scleritis. The sclera is the white, tough fibrous membrane forming the outside tunic of the eye. When this tissue becomes inflamed it is called scleritis. This complication is often associated with systemic diseases, most commonly rheumatoid arthritis. It is also associated with disorders related to menstruation and is therefore more common in women, usually presenting after the age of forty. There are three levels of intensity associated with the presentation of scleritis. The most common is diffuse scleritis. In nodular scleritis the symptoms are more intense. With necrotizing scleritis being the most severe. Your physician will determine the most effect course of treatment. Anti-inflamatories, steroids, antibiotics and surgery for more dramatic cases are options available for treatment. The uvea is the middle layer of the eye. 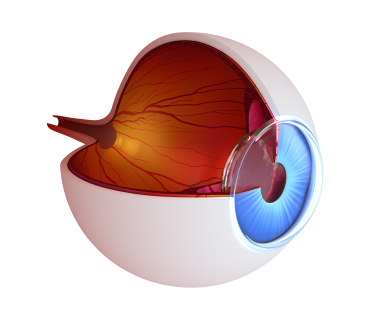 It consists of the ciliary body which holds the crystalline lens behind the iris, the chroid which is the rich vascular network that nourishes the retina, and the iris which is the colored part of your eye that controls the amount of light entering the globe by adjusting the size of the pupil. Uveitis is a painful inflammation of some part of the Uvea. Uveitis is a general diagnosis used to define an inflammation within the eye. It can be further classified as front (anterior), middle (intermediate) or back (posterior). This inflammation can present in a single incident or in chronic reoccurring episodes. Steroids are used to quiet the body’s inflammatory response and are the first treatment choice for uveitis that is not bacterial in nature. The prognosis is usually good for patients receiving prompt diagnosis and treatment. The iris is the colored part of your eye, just behind the clear cornea. The hole in the center of this structure is the pupil. The iris regulated the amount of light entering the back of the eye. Inflammation of the iris is called iritis. Infections and disease are common triggering agents. But, many times no cause for the inflammation can be identified. Iritis can be acute or chronic. Acute iritis presents rapidly, can clear on its own or may require medications to quiet the response. Acute iritis rarely causes visual impairment. Chronic Iritis which will reoccur unexpectedly over many years is much more difficult to treat. Chronic iritis typically does not respond to medications. Information provided in the Website is intended to aid in your understanding of the eye and its operation; it will not replace your physician. Have your eyes examined annually.